Rebate Apps for Groceries, Restaurants and Vacation. How to Save More! 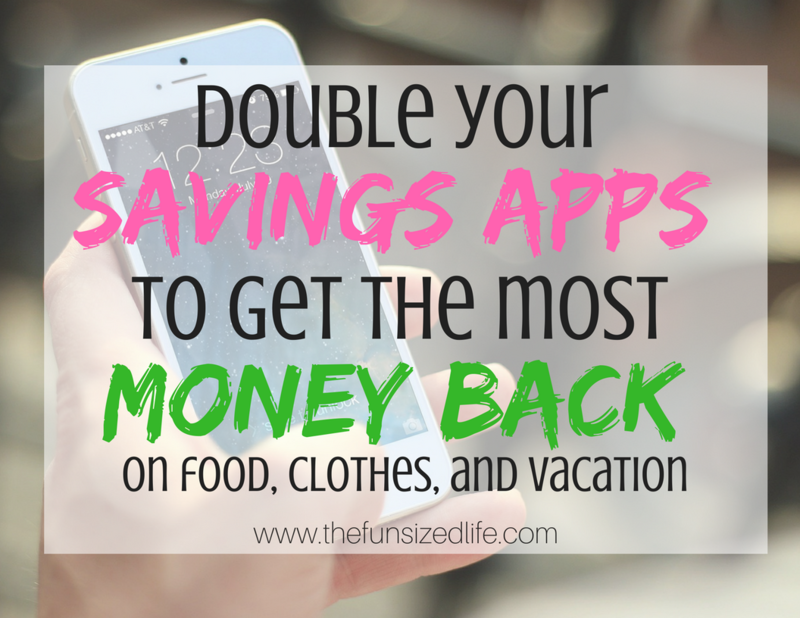 Double Your Savings Apps to Get the Most Money Back on Food, Clothes and Vacations! Gone are the days of crazy couponing, now we welcome the age of the rebate apps! If you are not taking full advantage of all of the rebate app options, you are missing out big time. Things like restaurants, bars, clothing stores, online shopping and even vacation packages all have extra money up for grabs! Often times, people are taking advantage of one easy to use savings app and are missing out on the benefits that all the other ones have to offer. So I am going to walk you through examples on just how much you can save if you use a little strategy and over-lapping with your rebate apps! Here are some detailed ways to double your savings apps to get the most money back! BeFrugal – BeFrugal is a website that shares literally every possible discount you can get (coupon or not) at all your favorite places. Their database is filled with all the different discounts, deals and BOGOs you can imagine! Plus you can also get money back on your purchases just like the rebate apps! Even better, you get $10 credited to you just for signing up and taking part! Checkout 51 – Checkout 51 is a couponer’s dream. They have all the best savings on your grocery list items and work with a wide range of grocery stores. When you get started, you will be prompted to select your location so you are sure to get all the best rebates available at stores in your area. Dosh – Dosh is so different from other rebate apps in the sense that there is a lot less thinking involved! There is no need to snap photos of receipts or keep track of purchases! You get $5 just for signing up, plus an additional $2 per card you link! Dosh then keeps track of your purchases for you and gives you money back on any qualifying purchases. Ebates – Ebates is probably one of the more well known rebate apps out there. However, if you still haven’t signed up, you can get $10 when you do! They have a huge variety of rebates and savings on stores, hotels, online companies and if you invite a friend you can get a bonus $25! Ibotta – Ibotta was the first rebate app I ever discovered and I about died I was so excited. Read all about my first experience here. I made $20 after one trip to Target and I stuck pretty closely to my regular grocery list. It was thrilling. Part of this money came from my first $10 for signing up though! Gotta love free money! Ok, so if you’re keeping track and you haven’t jumped on the rebate app bandwagon yet, this means you have already made $35 just for signing up! Hello, free money! Now let’s talk about how you can double up on these apps to make the most out of your savings at all your favorite places. Keep in mind, these deals were around at the time this post was written and are used as an example of how to best use the apps. The deals may change, but the function in which they work can still benefit you in all the same ways. BeFrugal – BeFrugal, like I said, is all over the place! They will share with you all the best discounts and promos that any restaurant chain is currently running! So before heading out, definitely scan the different deals to make sure you can take advantage of any promos! Dosh – What I LOVE about Dosh that really makes them stand out from the other apps is that they partner with local restaurants! They will share their current rebates with you based on your location and some of those offers will include mom and pop places in your area! I love this because when it comes to eating out, I don’t always love hitting up the same ‘ol chain restaurants. Ebates – Similar to BeFrugal, Ebates has “the in” with a wide range of stores, food chains, online retailers and more. Right now they are running an awesome promo for 10% off with Restaurants.com. On top of that they are also currently running a promo where you can buy a gift card for a local place at a discounted price! You get $25 and only pay $10! Ibotta – While Ibotta doesn’t run too many deals with restaurants, they do frequently do “any bar” and “any restaurant” rebates! Just because a lot of these don’t overlap with restaurants, doesn’t mean you can’t take advantage of some seriously awesome food! There are online places to take advantage of like Blue Apron that sends delicious food strait to your door! Here is an example of potential savings when doubling your apps! When planning to save while shopping at clothing stores, there tend to be a lot more over-lap with the rebate apps! Which is super exciting. (At least to a shopaholic turned frugal minimalist like me!) There is nothing I love more than hitting up a good sale. Although I buy clothes less, I tend to spend more on higher quality items and yet I still refuse to buy things at full price. Thanks to these apps, I end up saving even more than reduced sticker prices! As you can see both Ebates and BeFrugal are running similar specials. However, BeFrugal gives a higher percentage of cash back, so that’s the scenario I went with. Keep in mind your receipt will still total $110 after you subtract $15 from $125. So when you get your rebate through Ibotta and Dosh, it will be giving you your discount off that number which winds up giving you a higher amount back! Just be sure to pay with a card that is linked to your Dosh account! Now for Hollister, BeFrugal shared the promotion that if you signed up for Hollister e-mails, you receive a $15 off coupon for the purchase of $100. The rest of the rebate apps had an additional 2% back each. That might not seem like a lot, but it wound up saving you 20% on your purchase! By now I think you get the idea of how to double up on your rebate apps in order to take advantage of the biggest amount of savings. It’s not as easy to break down each individual person’s grocery list. But, let’s just take a moment to overview the best ways to save at two of the biggest names in retail today: Walmart and Target. Depending on your location, you will have different local grocery stores, so I want to focus on the 2 big names that seem to be all over the place! Let’s break down which apps partner with these stores plus additional ways you can save as well! As you can see, you have a wide variety of ways and options to save when it comes to shopping Walmart. Often times with stores like Ibotta and Checkout 51, the discounts will end up being very similar, but it never hurts to check! So you can see, in comparison with Walmart, these rebate apps don’t offer as much rebate with Target. A large part of this is because of Target’s individual ways to save like their Cartwheel app and their Target card payment options. Cartwheel – Target has their own Cartwheel app in which you can shop discounts within the store that include their already reduced priced items from brands like Market Pantry. Target card – You can get 5% back on every purchase with a Target card. This can be a Target credit card or a debit card that removes your purchases from your bank account just like a regular debit card would! Double coupons – Target also is one of the stores that allow you to use double coupons. This way you can take advantage of Carthweel, Target coupons and manufacturer coupons as well. $25 off your first hotel rental plus discounted trips! As you start diving into your rebate apps, make sure you are paying full attention to their individual discounts. Sometimes Ebates may offer $15 back when booking a vacation and BeFrugal may offer $40. These offers both are only valid if you purchase through them. So in this scenario, BeFrugal would be your best bet. Where you can really double up is with Ibotta, Checkout 51 and other rebate apps that allow you to snap a photo of your receipt in order to get your discount. That way you don’t have to be purchasing directly through them, although sometimes that’s the case.